An expression of thanks: choreographer Oona Doherty crafts a religious reflection on her home town. Hard to be Soft – A Belfast Prayer, Dublin Dance Festival. Photo: Luca Truffarelli. Since the religious festivals of old, dance has found expression for giving thanks. But it’s less clear who to praise when faith becomes a political tool to divide and oppress. Instead of reaching out to a deity, choreographer Oona Doherty’s tender portrayal of her hometown devotes itself to the city’s inhabitants. This imaginative work, produced by Prime Cut, depicts Belfast in four episodes. Ciaran Bagnall’s fine design uses the glorious iconography of worship to frame the experiences of ordinary people. High-reaching wooden beams, transformed under glaring lighting, can resemble both an enormous chapel and a heavenly gate. Early on, we find a thurible cracked open, its smoky incense climbing into the air, as three hooded figures watch on. It’s a poignant reminder of personal faith mishandled as political puffery, given sombre resonance by the guitars of David Holmes’s splendid music. There’s a sense of barely concealed trauma throughout Doherty’s production. Nowhere is it more apparent than in her outstanding solo, which weaves a tapestry of heartache and suffering. From a threatening wretch, she warps into an un-fussed onlooker, before tensing into an agonising soul howling in silence. Inner turmoil cannot be contained under defiant posturing. Just as revelatory, the excellent members of the Ajendance company cut thrilling shapes in warrior-like choreography, before mouthing cries for help. A young woman is lifted on the shoulders of her peers, in a sad evocation of tragedy. Echoes of the Troubles are heard along the way. “Do you forget where you come from?”, a father angrily asks his forward-looking son, in a struggle danced by John Scott and Bryan Quinn. Their absorbing duet is a contest of strength, outlining a family’s tortured history. This may be an immense reflection on Belfast but Doherty doesn’t seem to know what to do with the sum of its parts. In another solo, despite fascinating balletic undertones, she displays a lot of gestures we’ve already seen. Later, there’s a poem that mentions Jesus bricking car windows and generational cellular imbalance, while a divine light beams as if sending a message out. Such an elegant coda doesn’t feel earned. And yet, it’s still easy to see Doherty’s production like a prayer, an expression of thanks. In choreography seeking the expanse of a city, the difficulties of contemporary life are acknowledged but the city, never condemned, is affectionately loved. 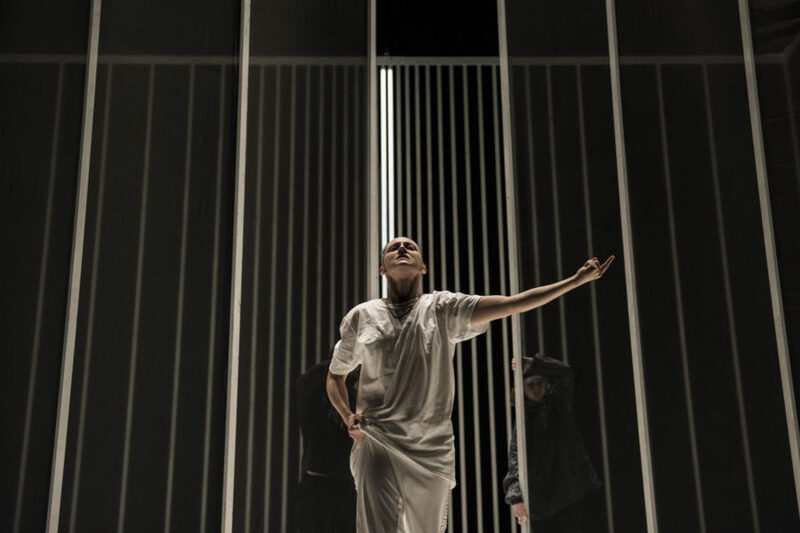 Hard to be Soft – A Belfast Prayer was at Dublin Dance Festival until May 19th. For more details, including future dates, click here.